Our September catalogue was a complete sell-out, highlighted by the Oor Wullie artwork which realised £1150 and Reginald Heade’s pulp fiction cover painting Lady, Mind That Corpse at £1452. A rare run of the first six Beano and Magic-Beano Books did well with £2090 for 1940 in low grade and £1320 for the 1942 issue in fine plus. 1944 is a difficult year to come by and a good grade copy doubled estimate finding £739 from a buyer who had been searching for a copy for some years. High grade bound volumes of late 1950s Topper comics commanded high prices with complete years of 1957 and 1958 fetching £667 each. Beezer was not far behind with 22 early issues in three bound volumes at £660. Most 1960s Rupert Books have their Magic Paintings coloured in, so when we were able to offer the years of 1960, 1961, 1963 - 1966 and 1968 with paintings untouched in very fine to near mint grades, there was strong bidding. 1960 realised £363 and the other six found a single determined owner who paid £266 a copy. By the 1960s The Beano Comic was finding increased market competition from other similar titles including Beezer and Topper from its own publishers and the popularity of colour TV with its dedicated childrens’ programmes. This resulted in lower print runs for 1960 to 1964 . Lots 110 and 111 featured near complete runs of these years where the average price leapt to over £9 a copy, double what you might expect to pay at auction for 1950s issues in similar grade. Seven months ago we featured a magnificent run of early Commando comics from No 1 - 100, mostly in grades between very fine and near mint. Offered over 53 lots they realised a staggering £6550. Since that remarkable sale and the publicity it generated, a great many issues in varying grades have come on to the general market. This has resulted in wide price variations and a levelling off of interest as dedicated collectors fulfil their long term wants lists over a short period of time. Once the digestion process has taken place Commandos may once more conquer their March 2002 high ground as recent buyers expand and upgrade their collections. This situation can happen with any commodity that is in over supply for a short time. 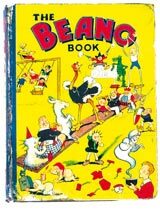 There was an auction some years ago where two rare Beano Book first issues were offered in the same sale. The immediate perception was that these items were no longer rare although only eight or nine have surfaced in the last eleven years. With the passage of time the value of these scarce items has held firm. In short - price is governed by the rules of supply and demand.